All photographs and photo-stories will be showcased in this Blog once a day, week, or whenever I feel like it. "Success!” “Success! !” Success!! !” - the veteran Tamil actor Sivaji Ganesan delivered these words as first ever dialogue for the Tamil film Parasakthi at AVM studio, Vadapalani, Chennai. At the same point, where Sivaji Ganesan faced camera, now stands as a monument at AVM Studio, Vadapalani, Chennai. Parasakthi, a Tamil movie released on 17 October 1952, introduced Sivaji Ganesan into his film career. The screenplay and dialogues for this film were written by Dr.Kalaignar M. Karunanidhi and was directed by R. Krishnan and S. Panju, under the banner of National Pictures. It was jointly produced by two companies – National Pictures and AVM Productions. Since the film dialogues were criticized Brahmins and Hindu customs and practices, the then ruling State government even thought of banning the film. However the film, a trendsetter for dialogue and acting (by Sivaji Ganesan), was a commercial success and had a theatrical run of over 175 days. The veteran actor Sivaji Ganesan wished to celebrate the golden jubilee of his film entry. Unfortunately he died in 2001. The autobiography of Sivaji Ganesan (Title: Sivaji Ganesan: Autobiography of an Actor) was released in Tamil on 1st Octobet 2002 (his birth day) and the English version was released in 2007. AVM studios wanted to commemorate 50 years since the release of Parasakthi. Acoordingly the monument was inaugurated in AVM Studios on 17 October 2002 by Tamil actor Kamal Haasan in the presence of Sivaji Ganesan's sons Prabhu and Ramkumar. 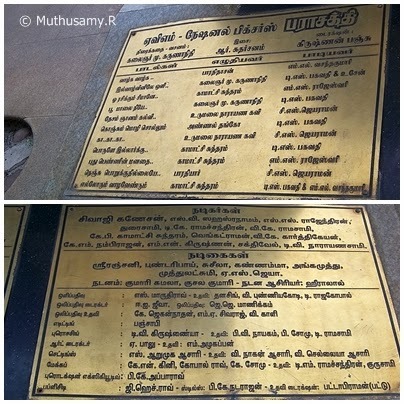 The monument has the black granite slab standing vertically with a fiberglass medallion bearing the close-up of Sivaji Ganesan (sporting a hat as he appeared in the scene) uttering his dialogue “success.” The bottom portion of the vertical slab also bears a rectangular plaque with details about the inauguration of the monument. Another rectangular slab (designed like the pages of open book) is located horizontally at the bottom of the vertical slab. There are two brass plaques, embedded on the open book, bear the names of the star cast, and technicians and other personalities who worked in the film making. இன்னா செய்தாருக்கும் நன்னயம் செய்த அரசன். தினமலர் சிறுவர்மலர் - 13. சரவணா ஸ்டோர்ஸ் வாடிக்கையாளரை தாக்கியது உண்மையே! – நீதிமன்றத்தில் ஒப்புதல்.